I recently visited Yadagiri gutta sri Lakshmi Narasimha Swamy temple with my parents and siblings. While going back I came to know that we don't visit the old temple. I did search on the wiki about the difference between these temples. But still, I didn't figure out the difference. Is old temple and new temple different? If different then why people are visiting only new temple instead of the old temple? Did I miss the actual temple visit? I visited the temple on hill but not old one. When you say, that you visited the temple recently, I presume that it has been within the past couple of months. The new temple is being built in place of the older temple under the supervision of Sri Chinna Jeeyar Swamigal. The moolava murthy is enshrined in a cave. He gives darshan in three forms of jwala, gandaberunda and yoga narasimha. During the phase of any modification or construction or renovation work that happens, balalayam is done. It is also the preparatory step before a Maha kumbabishekam. That is the Shakti of the main diety is passed on to pratibhimbas or to the utsava murthy. So maybe you had darshan of the utsava murthy. 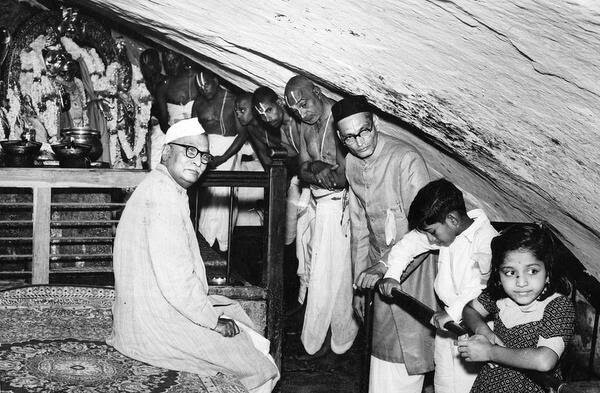 Here is an image of Dr. Rajendra Prasad inside the yadagirigutta cave. Here is a news item from The Hindu about the renovation works. Not the answer you're looking for? Browse other questions tagged history temple narasimha .